Silence filled the Helix as the ship sat stationary on the smooth, shiny surface of the small planetoid the Mirrored Temple had pointed the crew towards. Dmitri, Morgan, and Alex were still off exploring the world while the rest of the crew remained on the Helix. Shandra would have liked to be out there with them, but in her current condition, that was out of the question. The pain that whatever it was that was on this planet was causing her had subsided thanks to the medication, but she was not in coherent mental state thanks, of course, to the medication. So, instead, she was laying in the medbay, silently amusing herself in what little ways she could, between MARIA’s continued administrations of medication. You’re a good little robot, Marie, you know that? MARIA gave no response, as Shandra hadn’t actually said this aloud. Did you know I’m a robot too? Well, sort of. MARIA wasn’t much for conversation. The silence was as maddening as the company. It’s a long story. Suddenly, Shandra felt the ship move. That’s not supposed to happen… right? She sat up in the bed and gazed out the viewport to see the metallic ground drifting away; the Helix was taking off. Yep, that’s supposed to happen, but that means… Shandra climbed out of bed as the ship broke free of the atmosphere and jumped back into warp space. Clearly her crewmates had returned. Shandra stepped out into the hallway and began haphazardly making her way to the bridge to see what the others had found. While the effects of the pain medication had begun to wear off, she still remained pretty loopy. Ow! Stupid wall. Loss of motor skills didn’t really help, and Shandra kept wobbling around and bumping into walls on her way. Woah, Shandra thought as she walked onto the bridge, her attention immediately captured by Dmitri’s hair, which was now a ghostly shade of white. “Your hair is shiny,” she said to her Romanov crewmate. Dmitri appeared to be ignoring her, so Shandra turned her attention to Morgan. Her gaze drifted down to Morgan’s arms, where she saw something strange: some sort of red stuff where her right hand was tightly gripping her other arm. “What’s that on your arm?” she asked, tilting her head and pointing at the young woman. Is it jam? I’m hungry. Am I hungry? Do I even eat? In her current mental state, Shandra couldn’t make sense of what she was seeing. There were several moments of silence, then Alex gasped. “Oh my God, you’re bleeding!” the girl cried. Oh, right. Blood’s a thing that exists. Silly me. Morgan said nothing, then turned and walked out of the room. “Bye, bye, see you later…” Shandra said, just before collapsing to the floor. Wheee. Between the pain and the medication, she no longer had the strength to stand. “Oh, hey, look, I’m on the floor now,” she said, as she laid down and began to play with imaginary things and the occasional spark of warp. She truly looked like the epitome of insanity. Her crewmates probably seemed a bit confused or concerned, but Shandra didn’t bother looking. There were several more minutes of silence, then the sound of Morgan screaming echoed into the room from the lower deck. As her brain processed the sound, Shandra suddenly sat up, snapping out of her delirium as a feeling of clarity overcame her mind. Something was wrong with Morgan and she needed to be there for her. Looking up, Shandra could see Morgan staring down at down at her with a look of pure hatred that she had never before. “GET OUT!” she screamed at Shandra with furious rage. As if by reflex, Shandra teleported herself outside the door, completely shocked. She sat down against the door and leaned her head back against it. It thudded against the cold metal as Shandra tried to make sense of what had just happened. Why? But try as she might, she kept drawing a blank, only able to focus on that one question: Why? “This isn’t like you,” Shandra replied. “What did you guys even find there?” Shandra wondered aloud, with some confusing mix of irritation and concern in her voice. “There was an evil Pokemon there…” Shandra heard Alex answer. She looked up to see the Sinai girl approaching. “I don’t, it’s just…” Morgan trailed off. Shandra heard Morgan walk away from the door, then the faint sound of her crying. She stood up, then tried to open the door, but it was locked. Alex reached for the console, presumably to try hacking the lock, but Shandra placed a hand on the girl’s shoulder before she even touched it. In an instant, she blipped both of them into the room. Shandra walked over to Morgan and tried to hug her, but she shrunk away from her touch. “Just leave me alone,” Morgan cried. For the first time in a very long time, Shandra felt so alone, despite being in the company of her friends. No… The room seemed to get noticeably colder and darker as the reality set in. Please, no… This was a feeling she was all too familiar with, and yet it was so new that it seemed alien. Not again. But then Shandra felt a warmth pressing up against her. She looked up to see Alex embracing both her and Morgan, pulling them in close. “You said we were family,” the girl said. “And families are there for each other… no matter what.” Shandra understood what Alex was trying to do, but the damage was already done. She broke away, a sad and dejected expression on her face, and quietly exited the room. Outside, Shandra walked over to the opposing wall of the corridor, leaning against it before collapsing to sit on the floor. Shandra wasn’t typically the emotional crying type, but this was different. Now I’m the one needing a hug, she thought with a slight, sad chuckle as tears started to glide down her cheeks. She reached for her belt and grabbed the first Pokeball her hand made contact with. She sent out its resident, which happened to be her recently acquired Amaura. Oh, thank God it’s a cute one, she thought as she wrapped her arms around it, pulling it into a tight hug. It was cold, but Shandra didn’t care. Her heart, somehow, felt colder and heavier by far. Her tears froze into little droplets on the Amaura’s hide, and the dinosaur curled its head around Shandra’s, seeming to return her embrace. Suddenly, Shandra was roused from her sobbing by the sound of the door sliding open. She looked up to see Alex walking out into the hallway. As the door slid shut behind her, Alex walked over to Shandra and plopped herself down next to her. “It’ll be okay,” the girl said, placing her hand on her arm. Shandra felt warmth seeping back into her through Alex’s fingers. “Will it?” Shandra asked. How can things possibly get better? “What’s that supposed to mean?” Shandra asked. Shandra looked at the girl, who appeared to be staring off into the distance. “I take it you have some experience with this sort of thing?” She asked. Shandra felt a weight on her shoulder. She looked down to see the girl resting her head, in a cute, comforting way. Shandra couldn’t help but smile as she, in turn, leaned in and rested her head on Alex’s. You know, maybe she’s right. Maybe things can get better after all. Alex lay on her bed, staring up at the ceiling. The holoscroll Gilgamesh had given her sat next to her, deactivated. She had been trying to find out more information that could help her make some sense of what had happened on the Mirror Planet, but she had been unable to concentrate. No matter what she did, Alex couldn’t stop thinking about Shandra. It had been so long since Alex had felt anything like this. Ever since Naomi had left, she had felt like she could never feel that way about anyone ever again, but that was before Shandra came into her life. From the moment Alex first met Shandra, she had felt an attraction to her, and now, after everything they had been through together, Alex knew that she wanted Shandra to be a part of her life. She rolled over in her bed. It had been a long night, and Alex was getting pretty tired. Slowly, the girl began to drift off, thinking of the future she might one day share with Shandra. Suddenly, the sound of footsteps in the hallway snapped Alex out of her thoughts, forcing her awake just a bit longer. It was well after the time the rest of the crew normally turned in, so her curiosity was piqued and she decided to check it out. She got up and stuck her head out the door to see Morgan passing around the corner. What’s she doing up this late? Alex wondered. She hurriedly put her boots on, then followed after Morgan, trying to figure out what she was up to. As she rounded the bend and neared the catwalks overlooking the cargo bay, Alex spotted Morgan down below, emerging from her robotics workshop with EHRB, the ship’s repair bot, in tow. She also appeared to be carrying a Pokeball in one hand and what looked like Dmitri’s laser sword in the other. Alex quickly ducked out of sight as she watched Morgan cross the cargo bay and enter Shandra’s warp lab. Shandra sat against the wall, staring blankly across the room. The warp drive she had recently finished repairing sat in front of her, idly maintaining a sphere of warp which bathed the room in a soft violet glow. She had been trying to explore the limits of her powers— to discover some knowledge that could help her make some sense of what had happened in the Void, but she had been unable to concentrate. No matter what she did, Shandra couldn’t stop thinking about Alex. Shandra couldn’t remember a time when previously she had felt anything like this. After escaping with the crew from that God-forsaken research station, Shandra had found it hard to settle down and feel… normal. Morgan was one thing, but this was completely different. From the moment Alex gave that innocent, inebriated kiss in the hallway, Shandra couldn’t help but feel differently about her, and now, after everything they had been through together, Shandra knew that she wanted Alex to be a part of her life. She toyed with the ball of warp a bit, considering turning the drive off and finding some other form of amusement. It had been a long night (simulated, of course— she was in space, after all), and everyone aboard was surely asleep by now. Suddenly, the forceful sound of knocking on the door snapped Shandra out of her thoughts. Apparently not everyone. It was well after the time the rest of the crew normally turned in, so her curiosity was piqued as she wondered who had stayed up this late. She remotely opened the door and saw Morgan and EHRB make their way into the room. Something’s wrong. Shandra thought. She turned the drive off and cautiously stood up, noticing the Pokeball Morgan held and, more importantly, the laser sword in her other hand. “Give me the Cofagrigus,” Morgan said coldly, a look of anger on her face. Shandra had no idea how to respond, and could do nothing more than look back at her in confusion. “Give me the Cofagrigus,” Morgan said again, more forcefully than before, then activated the laser sword. Shandra’s confusion was quickly dispersed. “Morgan… what are you doing?” she asked with an almost cold tone of alarm. “We will never be safe until those things are dead,” she says. Morgan raised the laser sword, and pointed it at the Pokeball in her hand. It looked as if she intended to pierce it with the sword. “No!” the sound of Alex’s voice rang out as Morgan raised the laser sword to strike at the Pokeball. Suddenly, the Sinai girl leapt at her from behind, and wrestled the ball out of her hand. Alex fell to the floor as she suddenly found herself in a different location, and stared in a mix of shock and horror as the sword connected. Morgan stared directly at her, causing her to look down and realize she was still holding the Pokeball she had snagged. “Give it back!” Morgan screamed from across the room. “No! You were gonna murder it!” Alex screamed back at her. She jumped to her feet, and turned to run out of the room, but she wasn’t fast enough. Suddenly, EHRB fired one of H’s string shot grenades at her, knocking her into the wall and trapping her against it. Driven by her need to protect Alex, Shandra pushed back against Morgan’s sword, deflecting it away and forcing her back. She quickly grabbed her electric crystal dagger, and lunged at EHRB. The blade pierced the bot’s armor and, in a shower of sparks, it forcefully deactivated. “Morgan, you’re making a mistake!” she shouted. “It’s not a mistake! If I don’t do this, we’re all going to die!” Morgan shouted back at her. “You’re just a no-good Pokemon murderer!” Alex screamed, tears starting to run down her cheeks. She struggled against the sticky webs binding her, somehow managing to reach one of her Pokeballs and releasing her Houndoom. “You don’t want to do this!” Shandra shouted at Morgan again in anger. “Stop or you’ll regret it!” Morgan just looked at Shandra, a similar rage burning in her eyes, and blasted her with her mind. The burst of psychic energy sent Shandra flying across the room into the wall. Suddenly, Dmitri stepped into the room, presumably drawn there by the abundant concentration of anger and fear. He raised his hand and cast out his own psionic energy in an attempt to put Morgan to sleep, but nothing seemed to happen. “Diablo, stop her!” Alex shouted. The girl’s Houndoom leapt at Morgan and sank his sharp teeth into her arm. Not even wincing, Morgan stared at Alex with a look of cold hatred. But then Shandra saw her hesitate for a brief moment, and took the opportunity to pin her against the wall, pressing the electric dagger dangerously close to her neck. Soon the room was empty, save for a very pissed-off Shandra and a very stuck Alex. Without warning Shandra screamed, ramming the knife into the wall in an attempt to vent her anger and leaving a sizeable gash in the process. After a few moments of attempting to calm herself down, she carefully removed the blade from the panelling, and headed over to where Alex still lay affixed to the wall. “Are you ok?” Shandra asked, cutting away at the webbing that was restraining Alex. The girl fell to the floor, still covered in web, and Shandra collapsed down with her, easing her descent. “I… I think so,” the girl said as Diablo trotted over and gave her a few licks to the face, wiping away her tears. The Houndoom then looked down and whimpered, seemingly distraught that he got his paws in the sticky remains of the grenade. He pawed at the ground in an attempt to get it out of his fur. Alex let out a small laugh at this, just before Shandra wrapped her arms around her and pulled her into a tight hug. “I’m glad,” she said as Alex recalled Diablo and returned her embrace. The two eased up and sat there for several moments, gazing into each other’s eyes. Slowly, they drifted closer together, and Shandra could feel Alex’s breath against her skin. Shandra leaned in, and her lips locked with Alex’s. In that moment, the entire Galaxy seemed to stand still and Shandra felt her anger completely fade away. Nothing seemed to matter besides the two of them, and for the first time in what seemed like forever, she felt truly happy. Shandra pulled away, and realized that she had unintentionally gotten covered in the sticky web as well. “That… could have been thought through a bit more,” Shandra admitted as she attempted to flick it off of her clothing in mild disgust. Alex couldn’t help but laugh at the sight, and leapt at Shandra, hugging her again and knocking them both to the floor. “Yeah, maybe just a bit,” the girl replied, as they both lay chuckling on the floor of the warp lab. Author’s Notes: So this was actually one of the first chapters I planned for this series. When the idea of this alternate universe first sprang into my head, my brain immediately jumped on Volume 2, Chapter 18 because it was what was supposed to be the pivotal moment in Shane and Morgan’s relationship, and it was also the first instance of Shane using Ally Switch to save Alex from danger. To me, this seemed like the obvious moment that everything would come together. All that said, I’m very glad The Other Guy helped me write this because I don’t think all my ideas would have connected so well otherwise. I can definitely say that this is my favorite chapter of Blueshift so far. Given that the original chapter was so short, it made the most sense to just tear the whole thing apart and reconstruct it as one Blueshift chapter. I decided to open with Shandra on the bridge before the crew returned to just give the scene a different perspective from the original, and The Other Guy made it amazing. High Shandra is best Shandra. That brings us to the hallway scene, which is specifically the first moment of Blueshift I thought of besides the first chapter. The brief interaction between Shane and Alex in the original was ripe for expansion. It’s probably canonical to actual Spacemon that Alex shared her past relationship woes with Shane after the scene cut away (and probably would have been included in the chapter had Alex’s origin story been written before then). Obviously, given that Alex has feelings for Shandra in this universe, it would have gone a little further. In my mind, this is where Shandra definiteively would have chosen Alex over Morgan. The final scene is the one we changed the most. Given that Shandra let go of her feelings for Morgan, her reaction to Morgan’s insanity is far harsher than Shane’s. It’s only multiplied by the fact that Morgan is trying to hurt Alex in this scene. It dawned on me that Shandra using Ally Switch with Alex takes on a whole new meaning that it didn’t have when Shane did it very early on when thinking about how this universe’s story played out, although The Other Guy revealed to me once I started posting Blueshift that Shane had developed a little crush on Alex, which is why he always seemed to put himself in harm’s way to take Alex out of it. Given that that crush has actually led to something in this universe, it really makes the scene that much better I think. And, of course, the scene ends way differently, with Shandra staying to cut Alex down instead of confessing her love for Morgan and going after her. Obviously, we couldn’t end on a sour note, so we get to see the true birth of Shandra and Alex’s romantic relationship with a sweet little ending. From here, things can only diverge further and I’m excited to see where this story leads next since I don’t have much else planned. 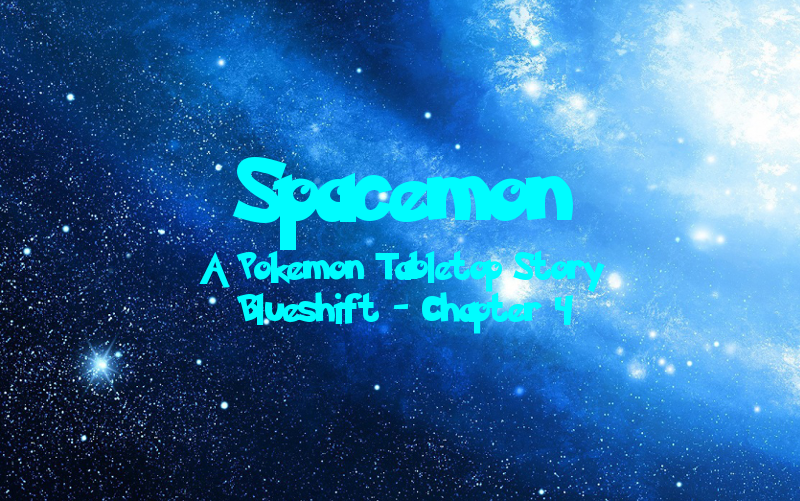 Spacemon: Blueshift - Chapter 5: Am I Not Human?